Thanks Reisenthel for providing me with a free shopping bag to review. Reisenthel has some of the cutest (on the go) products. All Reisenthel products are made with the highest quality, and are all very durable. For my review I received the Mini Max Shopper L Bag. 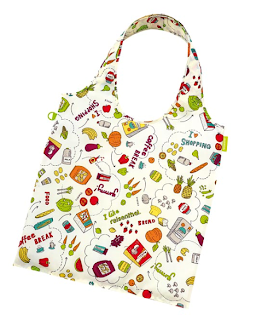 As you can see, The Mini Max Shopper L bag, is a reusable bag that you can take anywhere. The Mini Max actually comes in a small case. You can roll it up and it takes up very little space. So, just stick it right in your purse and you'll never forget to bring your bags again! As you can see, the carrying case also has a small clip on it, so you can easily just attach it to your belt loop, and even the strap of your purse. The Mini Max comes in more then 20 different colors/patterns and can hold up to 26 lbs! Wow! Thats alot, think about it, what could you put in there? 2 Watermelons ? haha :). The Bag above is what I received and I love it, it's the "I Like Shopping" Motif bag. I mean, hey... I do love shopping :). Everyone should be doing a little something to help the world. By making small changes like this (vs. plastic bags) we are cutting back on Plastic that is ending up in the landfills and oceans. Did you know that tons of animals die each year from our plastic bags?? When an animal ingests plastic it can either choke them or block there intestines. Which leads to an agonizing death. Especially in our marine life. Something majestic and beautiful.....the sea turtle... Hundreds of thousands of sea turtles and other marine animals die every year, from plastic bags alone. So, Stand up, and do something. Thanks to Reisenthel we can. And we can do it in a stylish manner. Reisenthel also has carry bags, wine bags, carry cruisers, bottle bags, and so much more! Go over and take a glimpse of Reisenthel's wonderful product line. Mandatory entry: Visit Reisenthel and tell me your favorite item. Please make sure I have a way to contact you if you are chosen as the winner! The winner will have 48 hours to reply to my email, or a new winner will be drawn. The giveaway Ends June 5th, 2010 at 11:59 pm. My favorite item is the same bag you got. Lucky lady! I love all fabrics with food on them. hehe. I like their carrycruiser. What a great way to carry things. I entered the leakey photography giveaway. I like the traveling toiletry bag L! i like their shopper xl, but all of their products are really nice! I like the Mother/Child bag. And like the one they send u too:-))Its cute! Love that its a very environment friendly bag too! I liked the Storagebox M. Very cool site. Thanks! My favorite is the motherchildbag. Thanks. the storage boxes are so pretty! i like the baroque sand! My fave is the Shopper XL Baroque Sulfur. Nice and big, and beautiful! It's a win! My fave item is the Loopshopper L! I like the flora Mini Max shopping bag - thanks! I entered the Flings Bins giveaway. I love the bottle bag red stripes! i like all of the bottle bags. Those are the cutest darned bags ever! I love your shopping one too!The Shopper XL Baroque Sulfur would also be cool! I stopped using plastic and started using all totes about a year ago and am so glad I did. I really like the little carrying pouch. I keep a couple of those types in my glove compartment---for those days that I forget my totes! 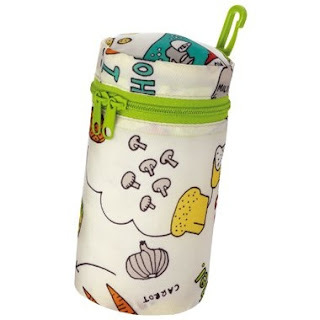 I really like the Travel Toiletries Bag. I entered the K Mart giveaway.